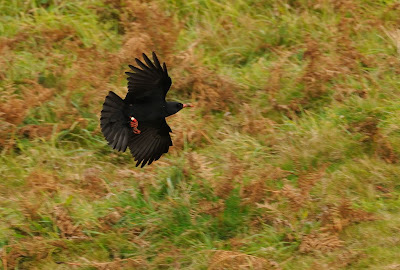 Choughs are a regular feature now in the Land's End and Cape Cornwall area though pinning them down for photography is not so easy. 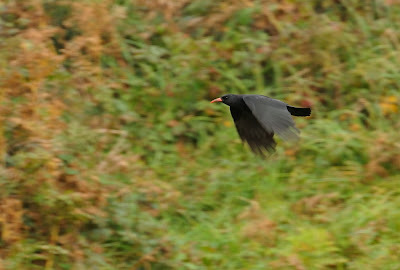 I have never considered targeting Chough for photography as they are normally quite distant. On Sunday morning though, whilst papping the Yellow-browed, at least five Choughs circled round me calling all the time. They landed in the opposite field and fed on a dung heap at 75 yards distance, digging ferociously and calling all the time. The Jackdaw shown on the lower left and a Magpie out of view tried to muscle in on the frenzy but couldn't get a look in. The flock of five stayed close together but a further three were seen together later in the morning. All of the images were taken with the 600mm F/4 lens and 1.4x TC, on a Jobu gimbal head. 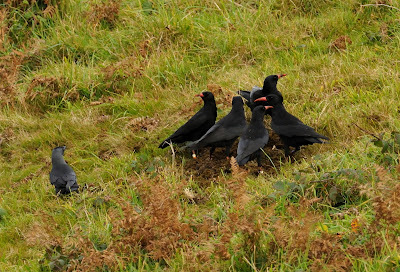 I was wondering when you were going to blog your chough photo's. I saw the first on Cwll birding. I will email a link to your site, to Nicola Shanks, who organised the chough watch in the spring to monitor the nest site. The group shot is a cracker, and the flight shot with visible leg rings will be of interest to Nicola and Clare Mucklow. Fabulous Steve. I have watched them at Nanquidno with the Jackdaws standing by for a scuffle! They are very entertaining and they capture your heart instantly.